In 2015, Visual Culture Research Center (VCRC) in Kyiv received the ECF Princess Margriet Award for Culture. VCRC’s Director Vasyl Cherepanyn was in Amsterdam in March and we took the opportunity to talk about the aftermath of Maidan, what the Award meant for the collective and the upcoming Ukraine referendum that will take place in the Netherlands on 6 April. Vasyl Cherepanyn at the 2015 ECF Princess Margriet Award for Culture. Photo by Maarten van Haaff. 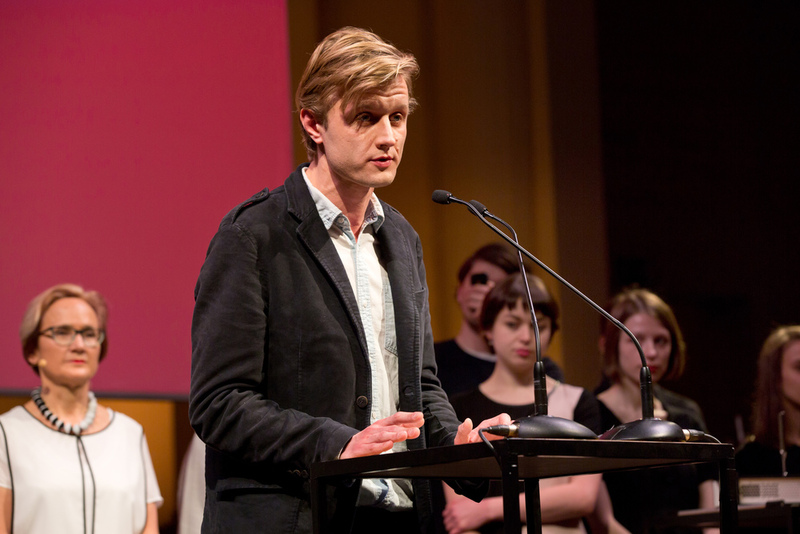 Let’s start with last year’s ECF Princess Margriet Award for Culture, what did it mean to you? Did the Award in any way change your position within the political and cultural landscape of Ukraine? I feel nostalgic about being at the Award ceremony again, this time celebrating new laureates. As for the impact on our work, I can speak from both a personal and an institutional perspective. I feel that ECF makes very precise political choices with every Award, which is unique among cultural institutions in the EU. While many organisations are trying to remain in the middle, it seems there is a more dedicated choice on ECF’s part. It is important that international organisations choose to follow this line, it is a performative gesture which has a long-running impact on a European scale. So yes, the Award does influence a laureate’s work, it makes it visible on an international level, and moreover, it gives the feeling that “you’re not alone, somebody sees you”. It is political in the physical sense too. The Award is made through the trespassing of borders - last year and in previous Awards, it was the very act of the local cultural actors trespassing into Brussels, re-appropriating the capital, which I find admirable, or bringing those voices from Hungary and Spain into the Netherlands this year. It can, next to that performative dimension, provoke and give birth to outcomes never imagined. I think the influence of the Award is more subtle. The benefits of winning the Award are not for the immediate future, but for the longer run. Therewith the Award isn’t a populist instrument, with populists always focusing on the immediate future. Populism is a “democratic seduction”, populists seem active and radical because they use direct force, but it is Ersatz politics. It’s a one-step action and it’s not radical in the sense that it offers an alternative. An award like this is therefore more radical. The title itself shows the motivation, and it works on a local as well as on an international level. It is the school of Maidan, the school of revolution. Maidan was made by masses, and one could see it as a process unfolding in front of one’s eyes. That’s why it was so important for Europe – it was like from the classic history, the basics of how Europe was born. Even the EU flag - the symbol of Euro-bureaucrats and transnational financial power - was transformed in Ukraine into the revolutionary flag, which has won. The idea of Europe was reborn on Maidan. With the School of Kyiv biennial, we tried to narrate the political subjectivity of Maidan and translate its message to the outside, because it contains a very important social experience and political practice for Europe, which can be the key to solve many of the current European issues. We don’t have Ukrainian problems; we have common European problems. The main challenge for the EU is that it is trying to keep its ‘centre’ safe and externalise all the problems beyond the European wall. As a result, you will have warfares and conflicts around - the EU now is surrounded by a belt of wars in its South and East, - and terrorist attacks and “refugee crisis”, which I think is a totally misleading term, as a ‘collateral damage’ inside. It is not a refugee crisis, it is the crisis of European politics. Maidan itself was a process of commoning. Imagine people in the hundreds of thousands start working as a coherent organism to get rid of the bloody regime, launch a new political process and constitute justice, - they just came and did it! It was like a political miracle which showed, that democracy, freedom, and justice are not just ‘values’ but basic needs. I think this referendum is one big fallacy. The right question to be asked is what does one try to repress through putting such votes to the public forefront, what is on the background? Usually votes of that kind serve as a litmus paper to test the level of support of the national or EU authorities regardless of the issue taken to a vote, and people vote against the ruling classes. BREXIT is another example. It’s all about the societies expressing their inability to act. The referendum is in reality a Dutch problem, Ukraine is just the weakest victim or a soft spot, an empty screen to project local frustrations. The referendum has appeared as an issue in that form because of the difficulty for the Dutch society to express its pain in a political way. The problem silenced through this referendum is the MH17 crash - that’s the main reason to question the referendum as such. Shooting down the plane is one of the ugliest terrorist acts of the recent years and a real face of the Russian military occupation of Ukrainian territories. The Netherlands and Ukraine have both suffered human losses in one war, Dutch and Ukrainian people share the same pain. That’s why being for Ukraine is an anti-war position. It is the second basic reason - voting for Ukraine is voting against the war launched next to the EU doors to hit it, to split Europe and turn it into the set of separated neo-feudal kingdoms fighting with each other. By crashing the MH17 airplane, the killers aimed at crashing the European Union, as the ones in Paris, they attacked the very possibility of Europe to be a common homeland for people of different citizenship. Now we see the ‘peripheries’, South and East, become more and more decisive for the future of the EU. The vision of what Europe is from the perspective of its margins is transforming its current EU embodiment. But the very reason why the EU was created still remains the main task of the highest importance for Europe today: to stop and prevent wars. And this war is not just against Ukraine, this war - as well as the terror war - is against Europe. Vasyl Cherepanyn speaking in Amsterdam in February 2015. Photo by Pip Erken. The Visual Cultural Research Center as an institution and The School of Kyiv as our project are meant to function as a translation machine in the political sense, - as a vehicle to translate political experiences and social practices on the international level, building common tools to work with. A new vocabulary, a new political language which can define our emotions, map the affects that drive us, and let us express ourselves in a precise way is one of the key issues at stake today. That’s why we had different schools within the biennial - the School of the Lonesome, of Realism, of the Displaced, of Landscape, of Abducted Europe, and of Image and Evidence, - with which we tried to indicate basic political emotions of nowadays and find proper words to express them. In fact, we need a common European vocabulary; it is the basis to make the understanding of our different experiences possible and to reflect on the solutions of our common European problems without hiding social reality.